Last Thursday the sleep deprivation finally got to me & on a whim I decided I wanted Grayson in a toddler bed ASAP. He has been waking up at the crack of dawn since mid-July for some reason & when it became 5:45, I was over it. I thought he needed a change. Well, Grayson got his "tools" and helped Ben "build" his new bed (for real y'all, G thinks he built his own bed! ha!) before naptime on Thursday. I just signed up for Weight Watchers again yesterday. I was a member for 2 months before I got pregnant with Griffin & lost some weight. I'll have a post soon about the whole "body after baby numero dos" thing. It isn't as pretty as the first time around. Both pictures taken at 3 weeks old. I need to start labeling pictures! 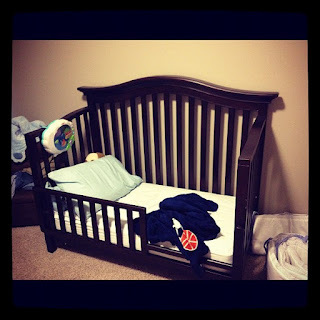 I have been the biggest baby about putting Griffin in his crib. I can't believe I ever thought that I could let him sleep in his own room from day one. I laid him in there on Sunday night & made it a whole 10 seconds before I scooped him up. Griffin just looked SO tiny & lonely in that big bed all by himself. So? He's still in our bedroom. I'll pretend like he sleeps in his bassinet all night long & never cosleeps with me. Pretend being the keyword. Also? The fact that I am exclusively breastfeeding, using my K'Tan baby carrier ALL THE TIME, and semi-cosleeping?! Well, I feel like I've gone all crunchy granola on you guys. Don't worry. I won't be getting a "family bed" anytime soon. Griffin will get his eviction notice soon enough. I think I have decided what every new mom needs: a maid service for the first 3 months. Honestly, this has been the most stressful change for me since having 2 kids. I feel like my house is a disaster 24/7. I had this great cleaning routine when it was just G but I can't seem to get everything done now. I know Griffin will eventually be on a schedule & things will get easier, but, 3 shedding dogs + a toddler + a newborn = my house looks like a tornado went through it at all times. It's making me a crazy person. The PP hormones this time are killing me. I feel like I cry about everything. I don't feel "done" having babies & I have always said I would love to have a baby girl. However, I did tell Ben that I am feeling super sentimental about all these sweet, tiny boy clothes. What if I do get pregnant again & have a girl? Then I may never use these sweet boy things ever again! *cue tears* Also, it was my decision to switch G's bed but I still got all teary when he transitioned so easily. Where did my baby go?! Laura, I agree about the maid service! I am due in two weeks and I am anticipating that this is a serious need! I don't know how you do it!! You are much more of a woman than I. I say we are only have 1 because, frankly, I don't know if I can take care of the 1 right let along multiples. I hope the PP blues end soon for you. You are a great Mommy - it's clear in your blog and IG. Oh my they do look just alike! I haven't transitioned Nolan into his toddler bed but he sleeps later than Grayson...glad it is helping him sleep longer :) and glad the breastfeeding is going so well for you...it's going well over here too! 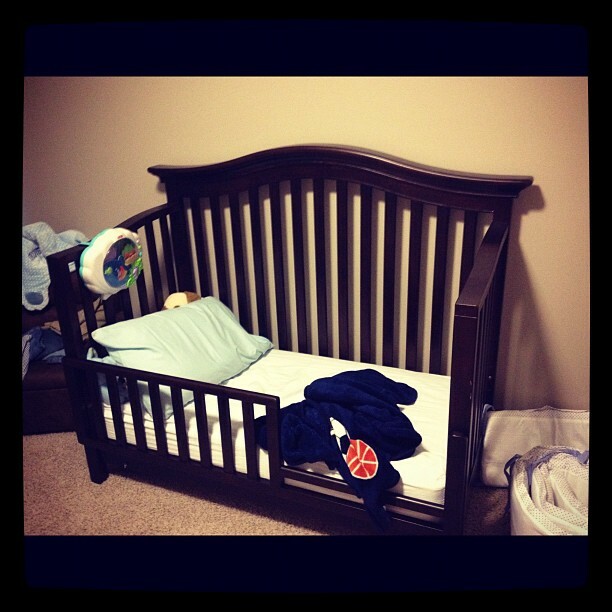 So glad Grayson did good in his big boy bed!! YAY!!!!!! I can't believe HOW MUCH they look alike! They are precious!!!!!! BOTH OF THEM! Don't worry about the house! It can wait. Snuggle that little fella!!! They look like twins! How cute!!! And you give me hope about the big boy bed. That's awesome that Grayson is doing so well! 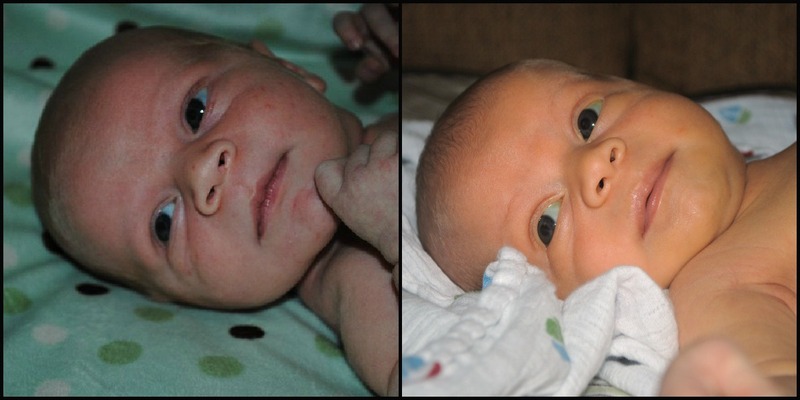 And seriously, your boys look so much alike - you almost have twins! Hugs mama, you're doing a great job!! You are such a good mama! I HATED the PP hormones and it always felt like no other moms ever talked about them! You are doing a great job girl! Your babies are beautiful.